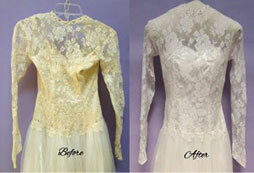 Restore your yellowed wedding gown to a beautiful off white color, remove yellowing and oxidation spots. With your order of Heritage Select™ wedding gown restoration, your wedding dress will receive expert care from our skilled staff. Our Heritage Select™ service provides excellent value for your money. You can also have your wedding gown preserved with either our Museum Method™ or Heritage Box™ preservation as well. *Restoration of aged veil tulle and lace is included in your order. Additional charges will apply for restoring headpieces or caps. After we receive your order we will send you shipping instructions and pre-paid shipping label by email within 24 hours Mon-Fri. Please use your own box, purchase one at FedEx (when dropping off gown) or purchase our shipping kit ($15 in cart.) Local customers call 866-268-4696 to schedule gown drop off. Please note: Heritage Select™ service package includes standard cleaning. Additional charges may apply if your wedding gown requires unusual care due to a variety of factors including: metal backed buttons, severely dirty hemlines, unusual embellishments or necessary repairs. If in doubt, call us at 866-268-4696 to discuss. All buttons, hemlines, embellishments and 3 hours of repairs are included in Heritage Couture – Wedding Gown Restoration.